BTX Global Logistics continues to make an impact in the community by sponsoring and participating in key events, such as the ‘Step Up for the Braves’ challenge. The 2018 event raised money for Homes for the Brave (HFTB) to help men, women and children leave homelessness behind. The not-for-profit organization has a special focus on helping veterans and their families. Other community outreaches 'BTX Cares' was a part of in 2018 include coat drives, toy drives and natural disaster relief initiatives. Click here to view the BTX Cares Photo Gallery. BTX expands its National Customer Service Center to support national accounts staffed with over 20 operational people focused on premier support and communications. BTX Global Logistics expands its global footprint with the opening of a regional branch in Nashville, Tennessee (BTX-BNA). BTX inaugurates its 72,000 square-foot world headquarters in Shelton, Connecticut. The environment-friendly (green) facility was designed to offer BTX staff the best amenities and provide customers with an in-house, specialty e-commerce solutions center. Click here to read story. BTX Global Logistics continues to expand its global footprint with the opening of a regional branch in Detroit, Michigan (BTX-DTW). BTX launches its new company website (click here to view the BTX website launch video). Btxglobal.com was designed as a tool for customers to use to learn more about BTX’s suite of services, connect with BTX stations, request quotes, and stay on top of Industry and BTX news. BTX expands into Laredo, Texas, with the opening of BTX-LRD. BTX President & CEO Ross Bacarella is honored by Hearst Connecticut Media Group’s Top Workplaces for his leadership skills, click here to read story. BTX Global Logistics is named a Top Connecticut Workplace by Hearst Connecticut Media Group for the third consecutive year. BTX also received that honor in 2016 and 2017, read story. 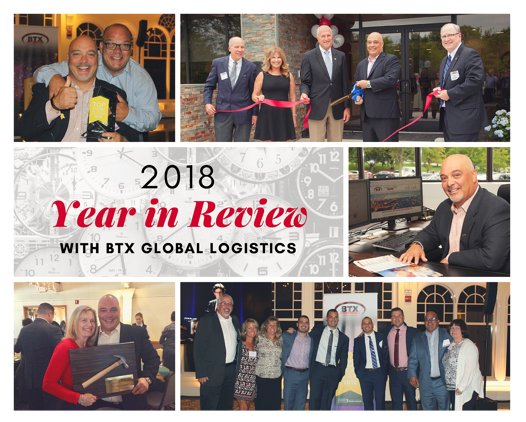 BTX Global Logistic opens its fourth regional center of 2018 in Roanoke, Virginia (BTX-ROA). BTX expands its e-commerce service offerings to provide clients with additional customer acquisition services, such as: Search Engine Optimization (SEO), Video Engine Optimization (VEO), App Store Optimization (ASO) and Pay Per Click (PPC) consultation. The Greater Valley Chamber of Commerce presents BTX President and CEO Ross Bacarella with the Silver Hammer Award. The Silver Hammer Award was awarded to a total of four businesses in recognition of significant construction and/or renovation projects in the Valley region of Connecticut over 2018. BTX Global Logistics was recognized for the completion of its new world headquarters in June of 2018. BTX is expected to open four more regional centers in the first quarter of 2019. BTX Global Logistics is a full-service transportation and logistics organization specializing in time-sensitive, heavy-weight freight and integrated solutions for customers in the U.S. and around the world. If you would like to request a quote, please click here. For career opportunities, please click here.